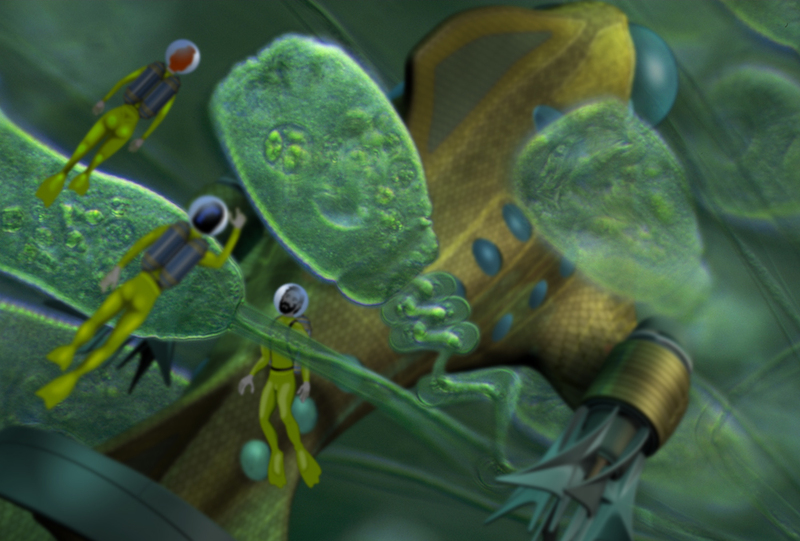 Read the latest installment of The Age of Discovery, Chapter 22: Microsia Aquatica Symbioticahere! 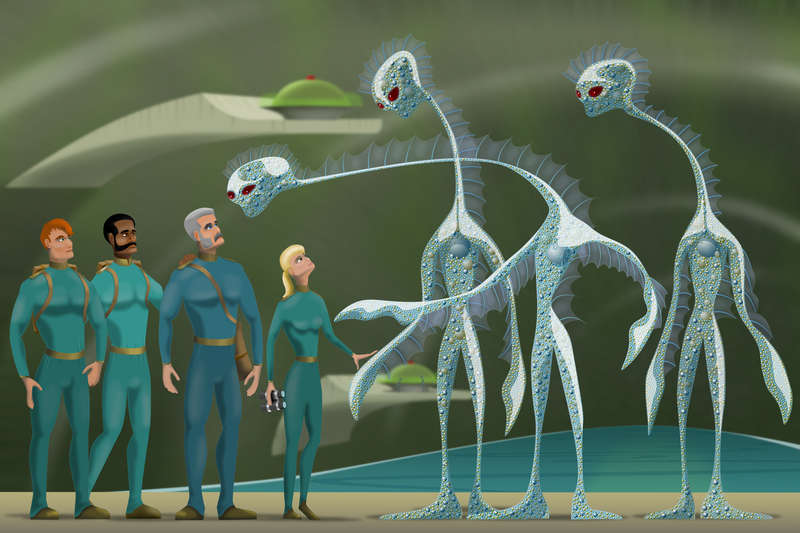 The Cyclops crew finally meets the elusive beings that have been watching them… the Microsia Aquatica Symbiotica. 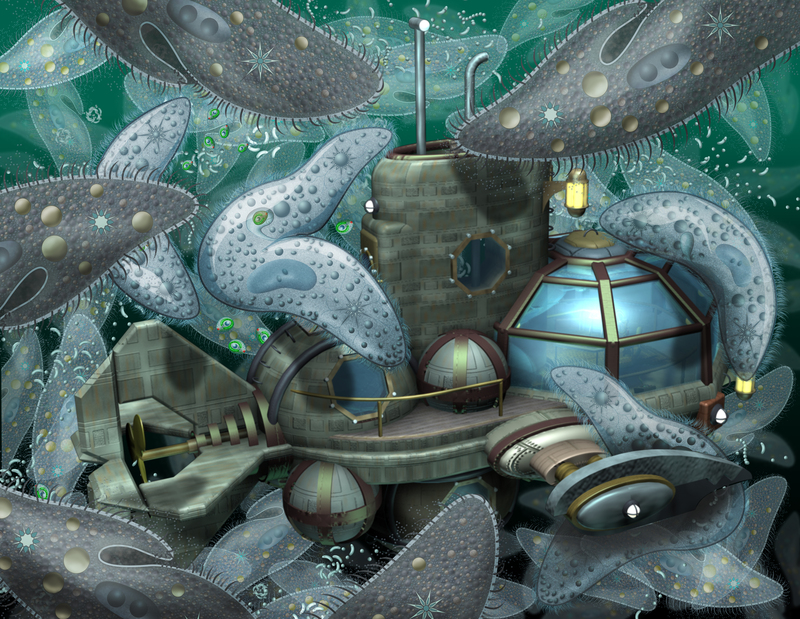 Enjoy the online portfolio of illustrations from the micro world here! 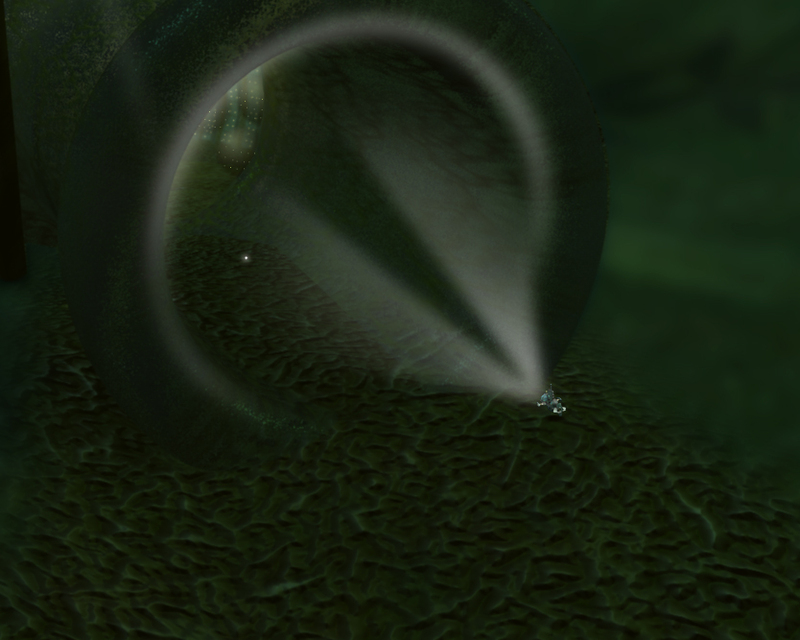 Exploration Journal: Trapped in the vortex we now have a terrifyingly closeup view of the copepod’s fan-like mouth parts. 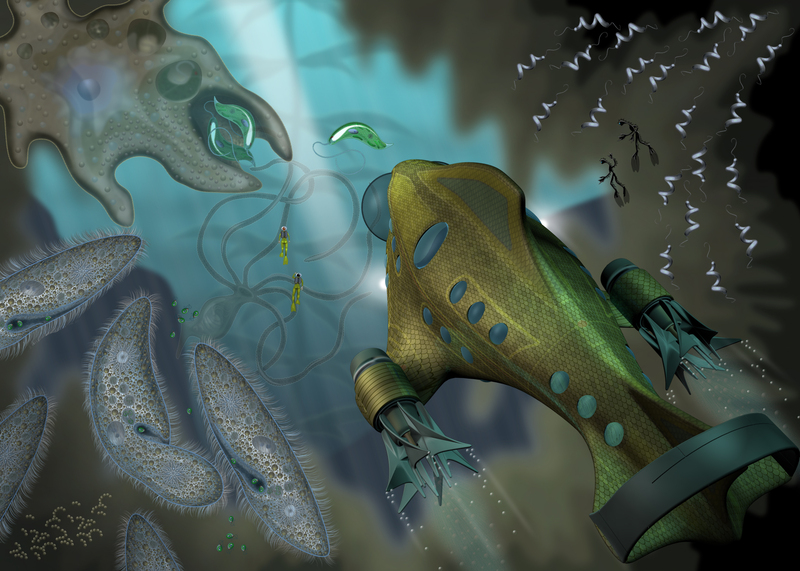 These fans create a current in the surrounding water that draws in smaller organisms such as algae cells, and in this case the Cyclops! 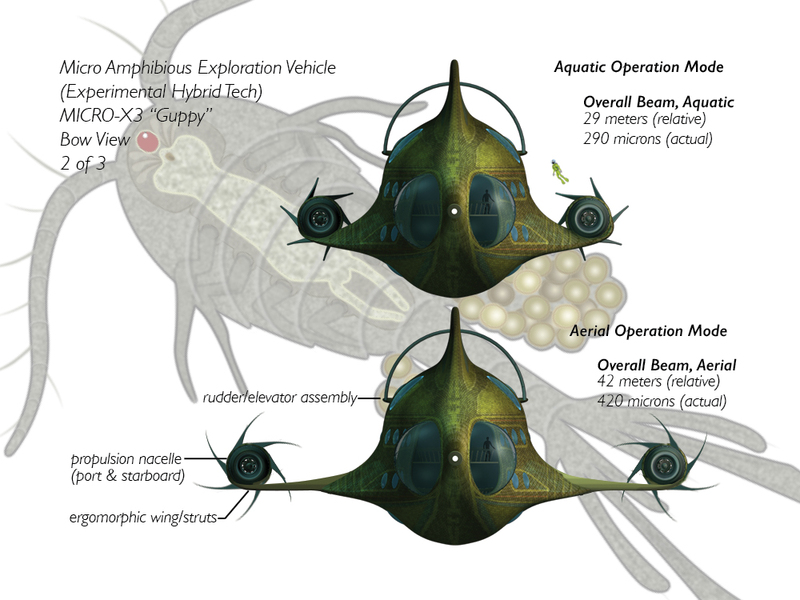 We are now in danger of being crushed by the copepod’s mouth. How will we escape this filter-feeding monster? A thought: When an object too large to devour becomes trapped in the animal’s feeding vortex, the beast must possess a simple way of rejecting it, like a reflex of some kind. That will be our only hope for escape. Copepods are crustaceans, relatives of crabs and shrimp. They have a hard shell-like cover on their bodies and jointed appendages. The largest copepods live in the ocean and are about 1 cm (centimeter) long. Most copepods in ponds are 4 mm (millimeters) long or less. 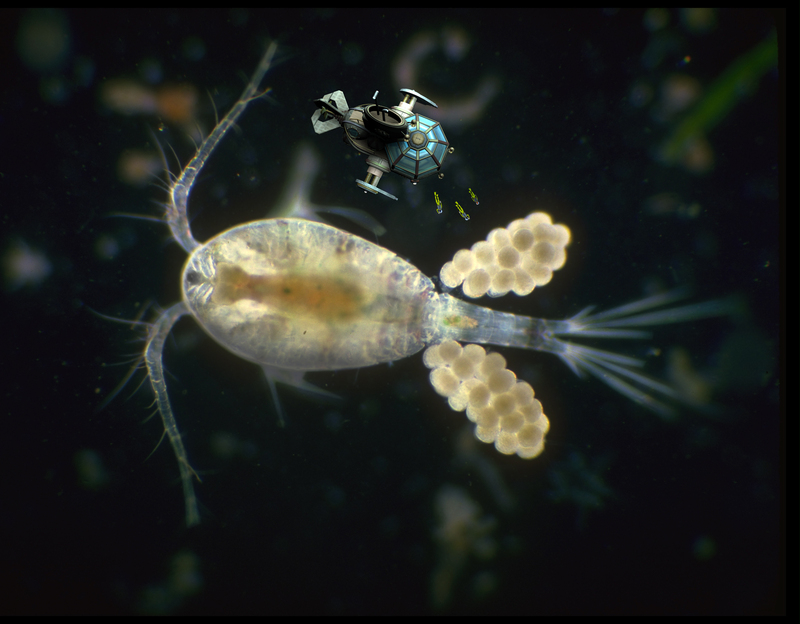 Copepods feed on tiny green cells (algae) that are also present in the pond (photoplankton). Copepods that live in the open water hold their antennae out to slow their rate of sinking, holding them where they can find the most food. 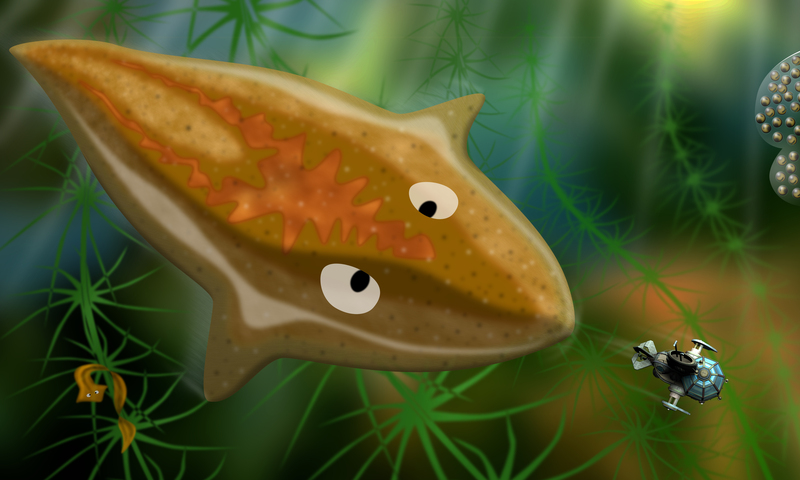 Their fan-like mouth parts create the currents that bring in food. Copepods swim on their backs using five pairs of swimming legs. Exploration Journal: attached to the tiny root hairs of aquatic duckweed, we find a thriving horde of Vorticella. 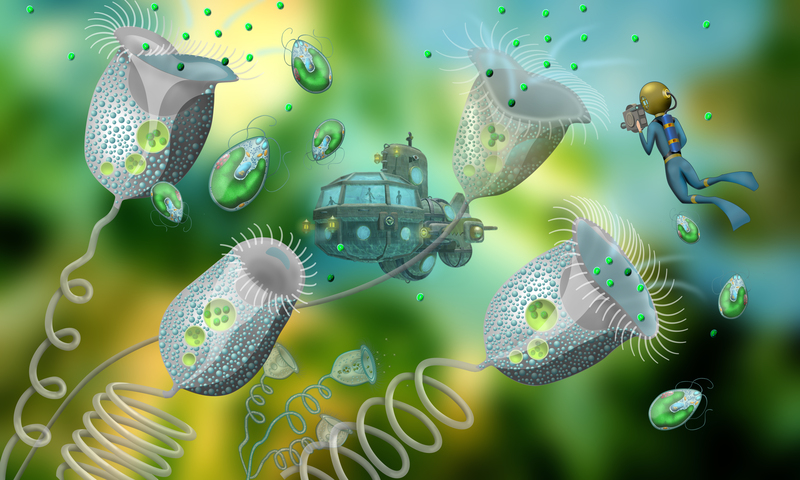 This single-celled organism feeds by drawing-in drifting prey, such as bacteria and small algal protists. It captures its hapless food by creating a feeding current with its cilia, which forms a ring around Vorticella’s oral opening. 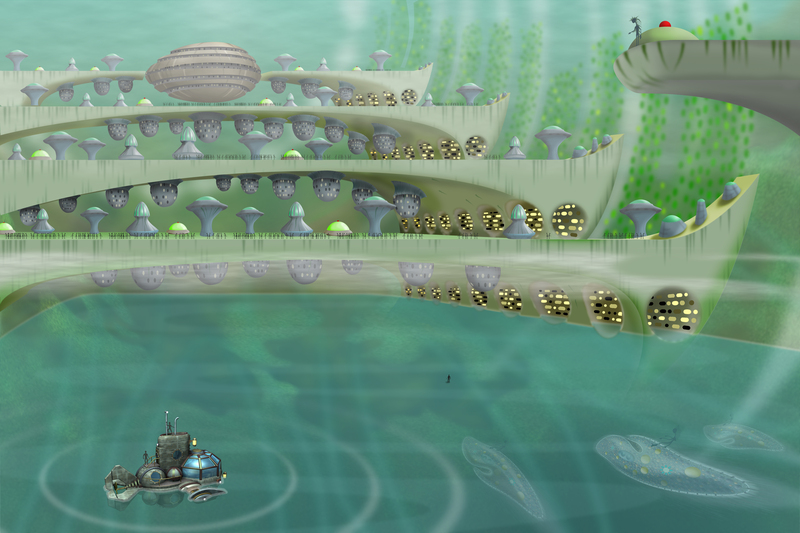 Vorticella is therefore classified as one of the ciliated protozoans. 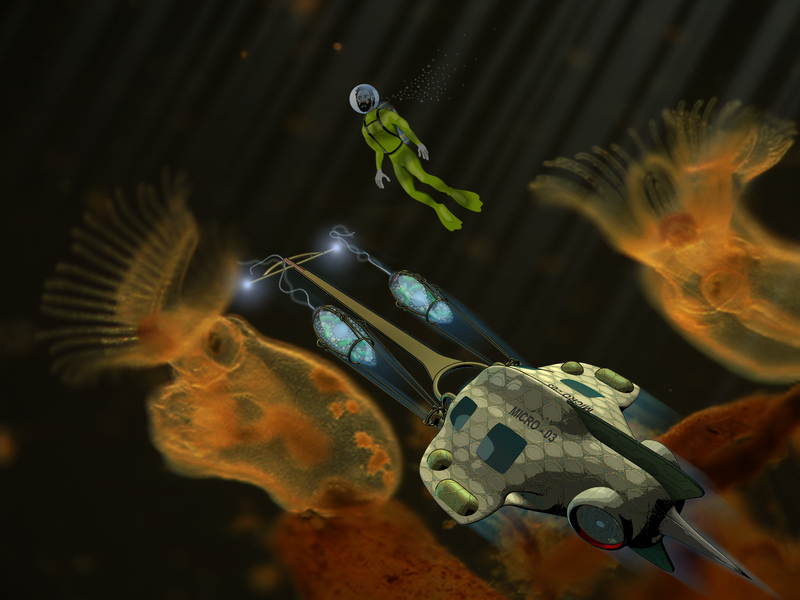 Exploration Journal: while exploring the shallows of a small reservoir, our aquatic scoutship has discovered a number of colonial organisms collectively known as Bryozoans. 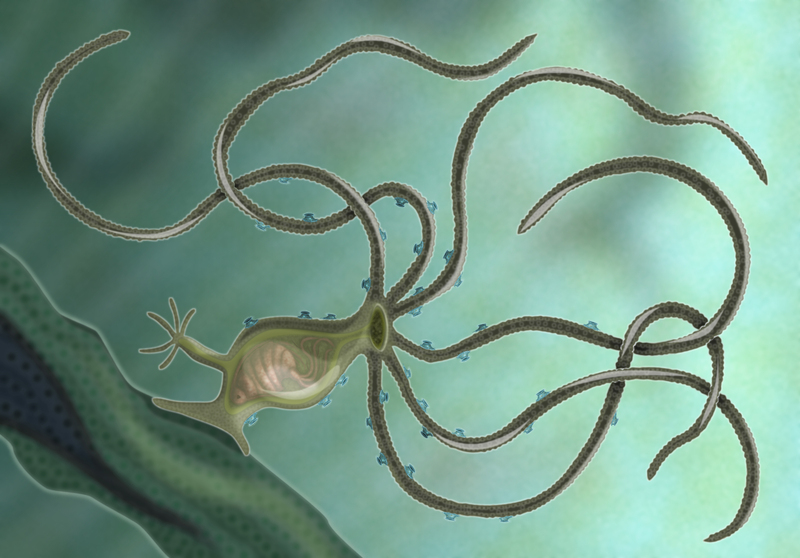 The colonies use cilia to create currents for drawing in microscopic food particles. 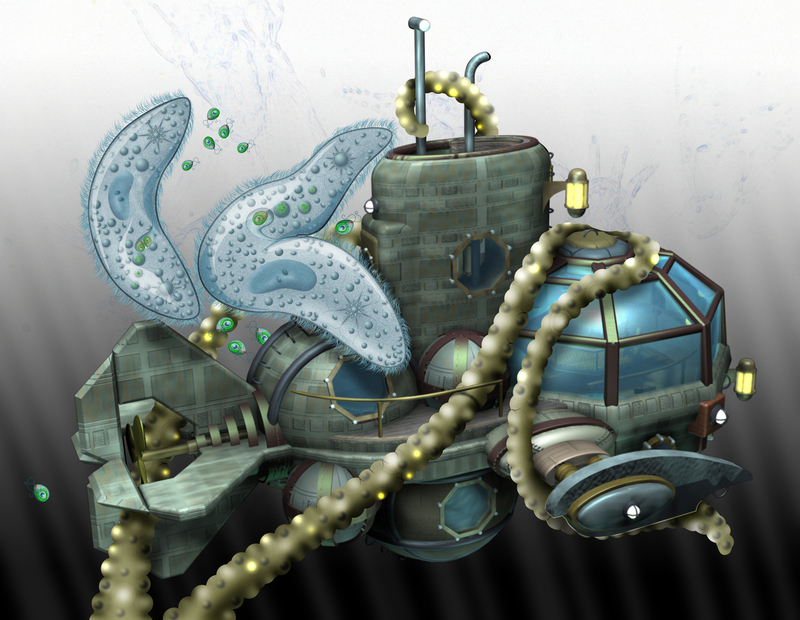 Specialized cells digest the food and all cells in the colony share in the bounty. 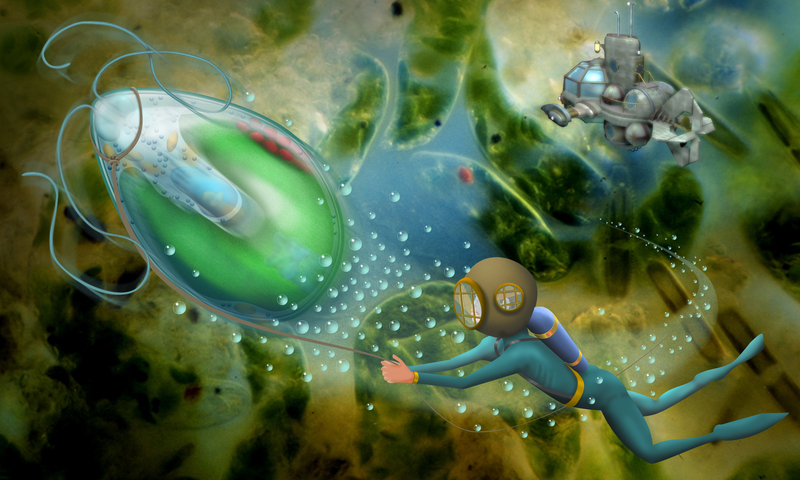 We know to keep some distance from the feeding cells, because at our size their feeding currents are treacherous. This particular bryozoan is species Pectinatella. 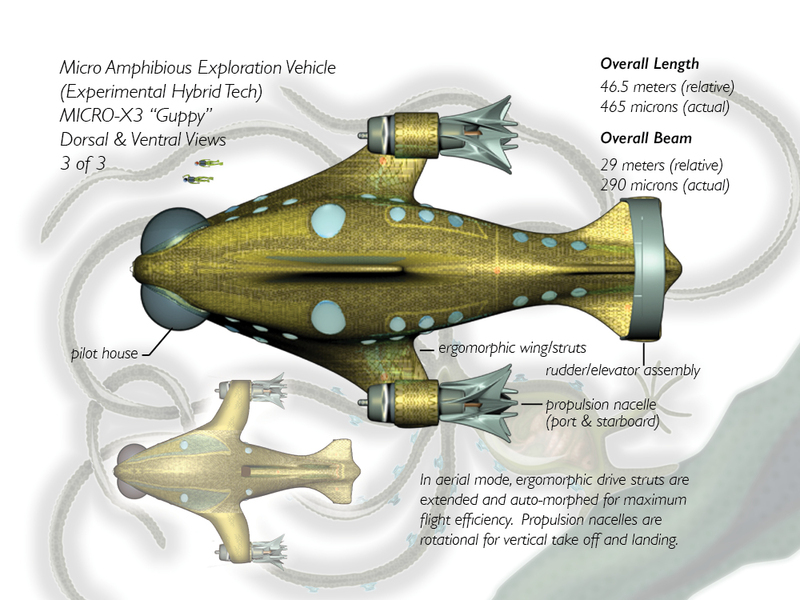 Exploration Journal: While cruising at .5 meters per minute, the Cyclops is brought to a jarring halt. 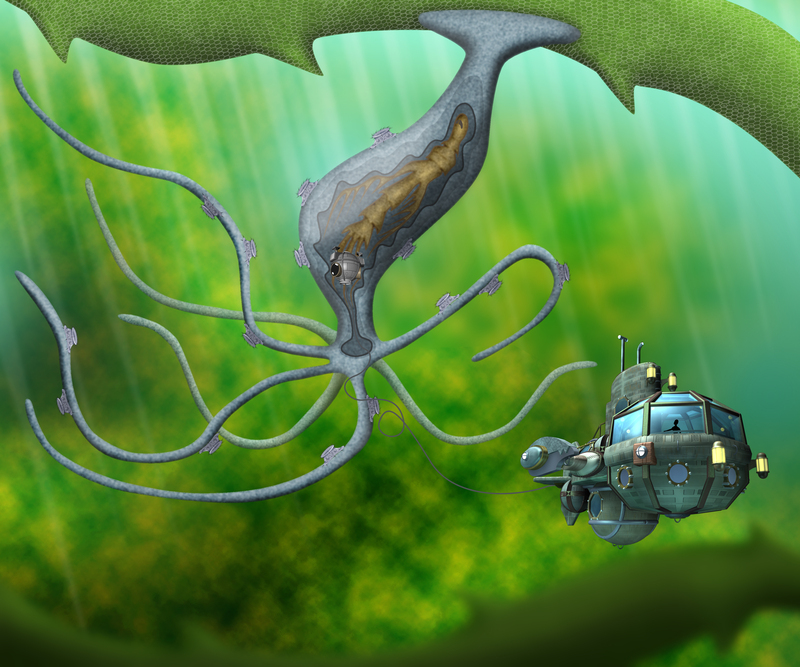 It seems that we have become ensnared by a tentacled monster… the Hydra! 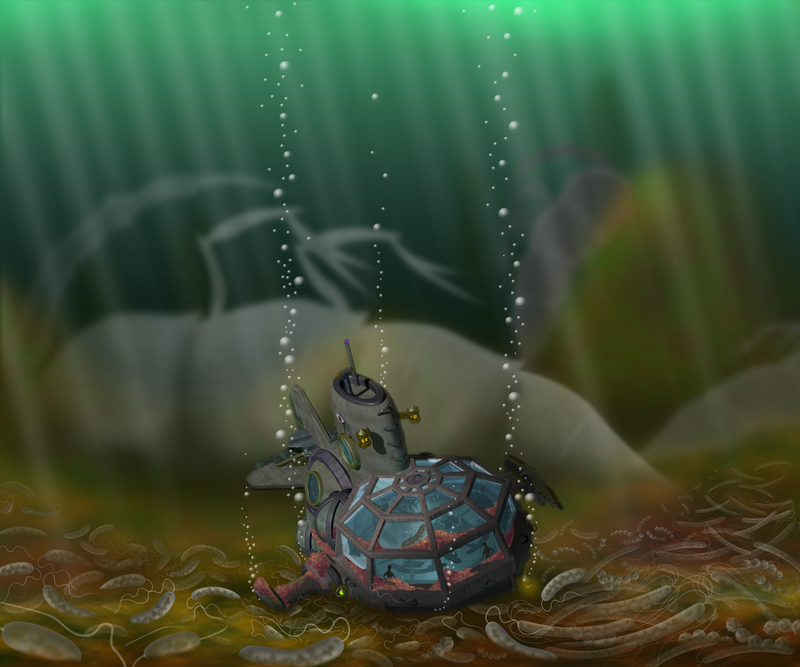 Stuck fast, we will have to get innovative to force, or entice, the animal to release its grip on our ship. 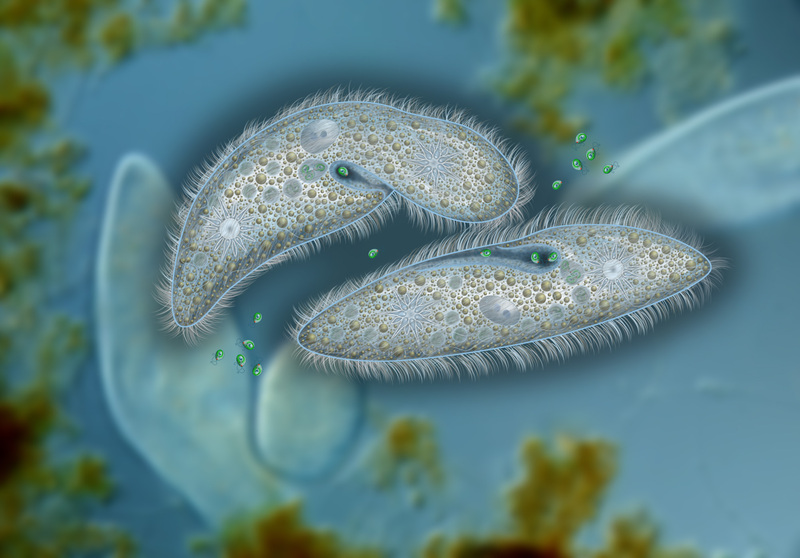 Nearby, a pair of Paramecia dine on small single-celled algae called Chlamydomonas. We hope that our fate with the Hydra is not similar to that of the small green flagellates.